We’d love your help. Let us know what’s wrong with this preview of Deenie by Judy Blume. When Deenie finds out that she has scoliosis, she’s scared. When she sees the brace for the first time, she wants to scream. But the words won't come out. And Deenie, beautiful Deenie, who everyone says should be a model, is stuck wearing a brace from her neck to her hips. For four years—or longer. She never worried about how she looked before—how will she ever face the har When Deenie finds out that she has scoliosis, she’s scared. When she sees the brace for the first time, she wants to scream. To ask other readers questions about Deenie, please sign up. My daughter loved this book. What would be another good book for her?. She is eleven years old. Sheila Shotwell Gone Before Spring. Especially now that your daughter is thirteen. The author (me) was very influenced by Deenie. The brace looks like the one Dr. Kliner showed us three weeks earlier. It's the ugliest thing I ever saw. I have to give the story credit - to my adult mind this vintage YA is still five stars. I read it at least three times growing up, but reading again was not boring in the slightest. Some of it came back to me, most I'd forgotten. It starts a little awkward but settles in fast thanks to Judy Blume's talented hand. She keeps the wording simple and the sentences short, but she's able to convey a wide range of emotion in doing this. Deenie would be an invaluable book for someone that age having to struggle with the diagnosis of scoliosis and wearing that life-changing brace for four years - it's inspirational, it feels real, and it's encouraging. Deenie isn't perfect - Blume rarely writes characters who are - but the short hand she's dealt in life does have the positive purpose of transforming her outlook on other people who also have issues. It changes the way she sees Barbara with her eczema, the 'special needs kids', and the elderly woman with the hunchback. I know some may see this as a condition she received to teach her a lesson, that there are those different from her, but I prefer to think the author meant that by a coincidence Deenie was able to open her eyes further when she herself receives the unsettling diagnosis. I don't think the event was created to make Deenie change - I just think the author showed how events like this can make people change in positive ways. Masturbation isn't discussed too much, but it's brought up a few times, including Deenie writing an anonymous question about it to the gym coach. I'm so saddened this book has been banned before because it discusses this just to say there's no shame. In 2004, the American Library Association labeled Blume the second most censored author in the past 15 years. Here is a good article discussing the issues of why Deenie has been so banned. Read these endearing children's letters about this and the aftermath to Judy Blume on this website, it was illuminating. Blume could have just written about an average girl getting scoliosis, but she threw in another issue some teens will relate to - parents who try to shape their kids into what they want them to be. Mothers who separate children by talents. "Deenie's the beauty, Helen's the brain." In fact, Blume based the inspiration off of meeting a 14 year old girl who wore a brace and was adjusting, but her mother was the one on tears and coping poorly. The book wins because it's not focusing on a certain condition, but an unchangeable event that will make a kid feel even more different than they already do. It touches briefly upon (and it was amusing really) masturbation and questions about this as well. It shows how some people stand out as different due to conditions, but that everyone is still the same and to be treated well. I remember when I was reading Judy Blume's Deenie about ten years or so ago (as I never actually did manage to read this novel as a child or a young adult), wondering with rather angry consternation at what ALL the frigging online and offline fuss has been about with regard to the book supposedly describing masturbation. Yes, there is I believe a question that "might" be about the latter which Deenie asks at school and there are also a couple of scenes where she is described as touching herself I remember when I was reading Judy Blume's Deenie about ten years or so ago (as I never actually did manage to read this novel as a child or a young adult), wondering with rather angry consternation at what ALL the frigging online and offline fuss has been about with regard to the book supposedly describing masturbation. Yes, there is I believe a question that "might" be about the latter which Deenie asks at school and there are also a couple of scenes where she is described as touching herself on a special spot in order to calm her nerves, in order to destress herself mostly whilst she is lying in bed (and why should she not, considering that she has just been diagnosed with scoliosis of the spine and that she also is having to deal with her mother and her mother's best friend who had only ever thought of Deenie as a model, as some kind of fashion queen and who now, after Deenie is being forced to wear a large brace day in and day out for some years, have basically and sadly pretty well dropped her like a proverbially hot potato). However, and at lesst in my humble opinion, these above mentioned bone of contention scenes in Deenie are absolutely NOT in any manner scenarios that describe sexual perversion or masturbation (for if one actually and with intelligence and an open mind reads these scenes, they are basically simply examples of Deenie using hands on relaxation techniques to self-soothe, to basically with and by physical contact therapy try to take some of her stresses away). And really, the only individuals who are seeing this as sexual and are wanting Deenie banned for this, are to and for me either reading something, seeing something in the novel that is not even there to begin with or have problematic sexual issues themselves so that they see anything that is remotely about someone touching themselves in some manner as inappropriate and sexually charged, which is at best really and problematically sad and depressing (not to mention that ANYONE who wants to ban and censor children's and yound adult books and remove them from libraries or classrooms is in my opinion at best a Fascist, a Stalinist, an entitled, undemocratic and dangerously dictatorial ignoramus, for even if Deenie did actually contain scenes of sexuality and gasp, masturbation, it should NOT ever be censored or banned). Picked this one up and read it in one evening sitting at the library -- it's a young adult novel that's under 200 pages. I was reading about Banned Books Week, and saw a lot of Blume's books on the list. This one was apparently banned for it's frank discussion of masturbation. Ridiculous. The topic only comes up by name once, and that in the context of girls' gym class discussion with their teacher. She has them write anonymous questions on cards, and then they discuss the answers. The sad thing Picked this one up and read it in one evening sitting at the library -- it's a young adult novel that's under 200 pages. I was reading about Banned Books Week, and saw a lot of Blume's books on the list. This one was apparently banned for it's frank discussion of masturbation. Ridiculous. The topic only comes up by name once, and that in the context of girls' gym class discussion with their teacher. She has them write anonymous questions on cards, and then they discuss the answers. I was diagnosed with scoliosis when I was fourteen. At fifteen I had corrective spine surgery. I remember the brace I had to wear after my surgery and I hated it! Although braces are different now, it was still unattractive and uncomfortable. Mine actually did hurt because the most sensitive part of my spine stuck out a little and the brace dug into it roughly. The first time I had to wear it at the hospital was the day after my surgery and I cried because it caused me pain. I recall a male phys I was diagnosed with scoliosis when I was fourteen. At fifteen I had corrective spine surgery. I remember the brace I had to wear after my surgery and I hated it! Although braces are different now, it was still unattractive and uncomfortable. Mine actually did hurt because the most sensitive part of my spine stuck out a little and the brace dug into it roughly. The first time I had to wear it at the hospital was the day after my surgery and I cried because it caused me pain. I recall a male physical therapist snapping at me and telling me it didn't hurt. Oh, I wanted to hit him! When my doctor finally said I didn't have to wear it anymore, I drew a bikini on it with marker and slashed the padding on the inside with a pair of scissors. Hey, I was fifteen! But it felt great being able to throw it in the trash. I've never read a story about a girl with scoliosis, and I wish I had known about this book back then. I'm thankful to Judy Blume for exploring this important subject, shining light on it, and for the young girl who inspired Deenie. I really liked how Blume wrote about Deenie's posture, because my own posture always bothered me and still does to this day. When I was in ninth grade, one of my shoulders was higher than the other and one of my hips stuck out more. I felt like a freak! I also like that Deenie had to see many doctors, because I lost track for how many doctors I had to see to get diagnosed, to get measured for my brace, and to prepare for my surgery. This book is about a teenage girl named Deenie. She has a spinal problem and has to wear a brace. Deenie trys to hide it at first and tries her hardest to take it off but her boyfriend ends up finding out. She gets invited to a party and tries to go behind her father's back and take her brace off but decides not to leaving a "Take me as I am or leave me." attitude with her boyfriend. Her boyfriend ends up liking her as she is and she realizes that she had nothing to worry about. I can connect D This book is about a teenage girl named Deenie. She has a spinal problem and has to wear a brace. Deenie trys to hide it at first and tries her hardest to take it off but her boyfriend ends up finding out. She gets invited to a party and tries to go behind her father's back and take her brace off but decides not to leaving a "Take me as I am or leave me." attitude with her boyfriend. Her boyfriend ends up liking her as she is and she realizes that she had nothing to worry about. I can connect Deenie to many teenagers or pree teens at our school, and their insecurities. I can understand how Deenie did not even want her friends to know about her brace. Still today.... I will always remember this title and the letter I received from Judy Blume. I related to the character with her struggles. "When Deenie finds out that she has scoliosis, she’s scared. When she sees the brace for the first time, she wants to scream." It was a tough time and I had rough years going thru this ordeal from 5th grade til 9th grade. No one ever looks at you the same, even when you don't wear the brace in high school. Thank goodness there were 3 middle schools coming into Still today.... I will always remember this title and the letter I received from Judy Blume. I related to the character with her struggles. My mother named me Deenie because right before I was born she saw a movie about a beautiful girl named Wilmadeene, who everybody called Deenie for short. To my ear at least, that's a flat opening in a flat voice. There is nothing making me want to read further. And that's the voice of the entire novel. I wonder if this story seemed fresh and groundbreaking back in 1973 when Judy Blume wrote it. Now it seems like a paint-by-numbers plot about a girl coming to terms with a medical problem. Judy Blume has a magical ability to get inside a girl's head, but in this case the head belongs to a rather pouty little princess in an unhappy family. She learns some Life Lessons, yes, but it's all rather dreary. Apparently the book earned some notoriety for its time because Deenie discovers that she enjoys masturbation and doesn't feel guilty about it, but it seems rather tame these days, like another earnest Life Lesson. Both Deenie the girl, and Deenie the book, have very little spark. It is the morning of the funeral and I am tearing my room apart, trying to find the right kind of shoes to wear. I like how Judy Blume followed Deenie through her scoliosis, from the diagnosis down to the doctor's visits with details of the medical procedures, like how the brace was made. And Deenie's character development, where she realises she can relate to people like old lady Murray and Barbara and Gena, although that was a little too preachy. I also the development of her relationship with her sister Helen. This book would be m great for young children or preteens with scoliosis or a major illness, o I like how Judy Blume followed Deenie through her scoliosis, from the diagnosis down to the doctor's visits with details of the medical procedures, like how the brace was made. And Deenie's character development, where she realises she can relate to people like old lady Murray and Barbara and Gena, although that was a little too preachy. I also the development of her relationship with her sister Helen. This book would be m great for young children or preteens with scoliosis or a major illness, or those who know someone who does. But one thing that struck me about this book is that Deenie's emotions or reactions aren't described. There's nothing about how she feels or what she thinks. I noticed it particularly in the chapter where she's getting the brace made. There's long descriptions of what happens, from being wrapped in the plaster, to the doctor telling her what to do, and wanting the plaster changed, etc. But you don't see Deenie being nervous or wondering what's going on, or feeling uncomfortable being held in the equipment in such an awkward position, or thinking that it's taking a long time. Her only reaction is being embarrassed that they're touching her body while creating the mould. She thinks, "I didn't like it at all when he had to smooth out the strips (with his hands) across my chest." But there's absolutely nothing else besides that. I would have expected that a 13-year-old would squirm or at least flinch away, but Deenie doesn't DO anything. Or how about the scene where Barbara helps her with her shoes? There's just a description of their conversation, and Deenie thinks "I felt like the world's biggest jerk". But there's nothing about how she feels about Barbara doing the shoe laces for her. Does she feel embarrassed that she can't do them herself, and that someone else has to do it for her like she's a little kid (something that I've heard a lot of preteens complaining about when they have to wear a brace)? Does she resent Barbara's interference? Does she feel grateful for Barbara's help? Nothing. In fact, when I read that paragraph, I expected her to react the same way she did when Helen offered to help her with the pad, like "I can do it myself". That was her attitude at first -"Don't treat me like a freak". But there was nothing to indicate that she didn't feel like that about Barbara's offer to help. Just that one line about feeling like the world's greatest jerk. I was actually surprised when she picked Barbara for a partner later, indicating that they became friends. I thought she would resent Barbara for butting in. Deenie was always told that she was beautiful and destined to be a model. However, everything changed when her PE teacher noticed that her walk was off, and her skirt was lower on one side. Taking the suggestion to visit a doctor, Deenie’s world came crashing down when she learned that she had scoliosis. No amount of exercise could correct it, there was only the horrid Milwaukee brace, but it’s large, painful, and covered her from neck to hips. With her mother devastated and barely able to look Deenie was always told that she was beautiful and destined to be a model. However, everything changed when her PE teacher noticed that her walk was off, and her skirt was lower on one side. Taking the suggestion to visit a doctor, Deenie’s world came crashing down when she learned that she had scoliosis. No amount of exercise could correct it, there was only the horrid Milwaukee brace, but it’s large, painful, and covered her from neck to hips. With her mother devastated and barely able to look at her, she was left on her own to discover if she could stand tall, confident, and beautiful in spite of her brace. A coming of age book that deals with an issue that doesn’t relate to every girl, but addresses many insecurities that are still relevant. Once again, highlighting the true art of Judy Blume’s writing, and the ability she has capturing the essence of adolescence. An unmistakable coming of age story by the all-time best-selling children’s author, Judy Blume. Since the 1970’s, Judy Blume has been exploring controversial subjects such as; personal development, teenage sexuality and religion. Proving the spirit of adolescence hasn’t changed in over 30 years, bravely giving answers to some of their greatest questions. Now, with it's many different cover changes, this book is available for a new generation. So yeah, this book essentially had me from the opening paragraph. But there's also a lot more here than that. But there's more even than that. So Deenie has scoliosis and has to wear a brace. This makes her hideously self-conscious and imagine not just being a teenage girl having to wear a brace. Imagine having to be "the pretty one" and wearing a brace. this book is about a girl - Deenie - who had scoliosis. at the beginning of the book her mom wants her to be a model. but when she goes to an appointment for a modeling agency, they tell her they don't like her posture. she goes to the doctor, and then he tells her she has scoliosis. her options are: to have a crooked spine and to be ugly for her whole life, to have an operation, or to wear a brace for four years or more. since her scoliosis wasn't so sirious, she wore a brace. at the first time sh this book is about a girl - Deenie - who had scoliosis. since her scoliosis wasn't so sirious, she wore a brace. at the first time she saw the brace she decided she can't do this. she will never go to the school with this brace. she will never go anywhere with this brace. she didn't want to go to school after this weekend. she just wanted one day to get used to it. she couldn't even look down with this brace! but her dad didn't let her. he said she had to go to school, with the brace. so she ran to her room, and she cut her hair and couln't stop crying. Buddy was a guy she liked from the beginning of the book. when she already had the brace, he tried to kiss her but it was hard with the brace and she didn't even kiss him back. Deenie, a seventh grader, wants to be a cheerleader. Her mom wants Deenie to be a model. Those dreams are dashed when she's diagnosed with scoliosis. Now she has to wear s brace and her life is over, or so she believes. First published in 1973 when I was YA age, DEENIE felt fresh and new. The rerelease, though still relatable and interesting, feels a bit stale. I'll bet most YA readers have never heard of looking something up in Encyclopedia Brittanica and will wonder why Deenie didn't just google her condition. Deenie felt flat, as I would expect for a girl who doesn't want to model, is disappointed at nor making cheerleader and then diagnosed with a life altering condition. Her mother and Aunt Rae were stereotypical stage mothers, though I loved her father and sister. I was actually reading this book, in secret, right when my mother heard about it being "nasty" from some other PTA lady. It was under my pillow, five feet away, when my mom asked me if I had ever read it, and ordered me to never touch it. Fortunately, I am a good liar. Anyway. Deenie is going to be a model, or so her mother has always insisted. But when she has to wear a scoliosis brace, she's not sure who is more upset: her, or her mom. She rebels, against the modeling, agai I was actually reading this book, in secret, right when my mother heard about it being "nasty" from some other PTA lady. It was under my pillow, five feet away, when my mom asked me if I had ever read it, and ordered me to never touch it. Fortunately, I am a good liar. Anyway. Deenie is going to be a model, or so her mother has always insisted. But when she has to wear a scoliosis brace, she's not sure who is more upset: her, or her mom. She rebels, against the modeling, against the way she's treated at school, against her parents, and who could blame her? She doesn't do anything particularly shocking, what she does do proves that she is both stronger and cleverer than anyone thought, including Deenie herself. This is a book about a girl with scoliosis. What?! Those exist?! I'm a 23 year old girl who has scoliosis and was told I had to wear a brace at age 13 unfortunately for me, my curve was too bad for a brace and I had to have surgery. I have two metal bars in my back and when I was 15 I had to have corrective surgery because one of the bars fell off. I wish I knew about this book at 13. I felt alone and a lot of self pity during my days at home and this book could have helped me. I found this as a This is a book about a girl with scoliosis. What?! Those exist?! I'm a 23 year old girl who has scoliosis and was told I had to wear a brace at age 13 unfortunately for me, my curve was too bad for a brace and I had to have surgery. I have two metal bars in my back and when I was 15 I had to have corrective surgery because one of the bars fell off. Damn you Reading Challenge. I will catch up, even if it means reading nothing but middle grade books for two weeks. And Judy Blume? This was not your best. Back braces and masturbation? I'm not quite sure what they have in common, if anything. And on the bright side, while I was bussing it to school today, I saw a transvestite (not transsexual) prostitute soliciting a man on crutches. Got to love Albuquerque. This is another Judy Blume book from my childhood. I loved all things Judy Blume as a pre-teen and teenager, and think she is a wonderful writer for young girls. 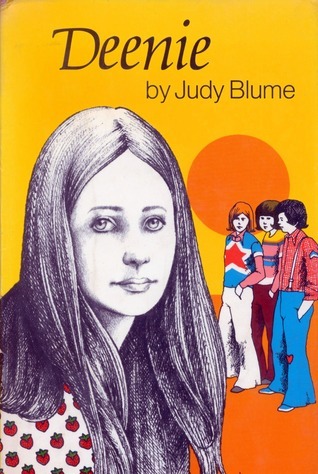 I am guessing that I read this book when I was around 12 years old, as I remember checking out many Judy Blume books from upper elementary school library when I was in the sixth grade. whenever someone mentions this book, its always about how deenie has scoliosis and has to wear a brace. no one ever, ever, ever mentions that its also about masturbation. so I'm going to tell you: its about a young girl who has scoliosis, but along the way she learns a surprising amount about masturbation. I don't think I read enough Judy Blume as a preteen, so I'm trying to do some catching up. I thought Dennie was a pretty well written book for its audience. It made me recall the horrors and amusements of being 12ish, which I suppose is the point. Such a nice throwback to girlhood reading. Blume never disappoints and manages to capture adolescence and girlhood insecurity so perfectly. Books date. Sometimes very badly. I had fond memories of Deenie from my own middle school days (which is why I have the 1978 paperback cover, which is the one I remember), and we've used it for our Decades project, in which case the horrible attitudes of the mother are very illustrative. (Deenie is "the pretty one", Helen is "the smart one". I can't imagine a mother in 2018 using that distinction. It's also weird how the father is always the one to drive to important appointments and is generally portrayed as being the parent in charge, which is not entirely bad because the mother seems unstable.) Still, I think I'm going to weed (eyes downcast with shame) BOTH copies that I have. So passes the glory of the world, indeed. Deenie's mother really wants her to be a model, because she's always been pretty and even won a contest as a baby. Since they live in New Jersey, they go to meet with modeling agents in New York City. They think that Deenie is pretty enough, but her posture isn't good. When Deenie tries out for the cheerleading squad and doesn't make it, her gym teacher calls home and mentions that Deenie really should see a doctor about her posture. When the diagnosis is scoliosis, Deenie convinces herself that she will have surgery to fix her back, recover glamorously in the polyester negligee her friends buy her, and go on with her life. Her mother engages in some whining hand-wringing. When it turns out that Deenie has to wear a Milwaukee brace, complete with boy's undershirt to keep the brace from chafing her skin, she does not react well. Her mother screams and cries, and when Deenie gets home, she chops off her hair. She has to wear Helen's old clothes, and is afraid that the boy on whom she has a crush, Bud, won't like her if she has on the brace. Eventually she settles in (this is a short book, just 159 pages), and tries to go to a party without wearing her brace. Her father insists, and it's okay because Bud likes her and kisses her even though she is wearing it. Strengths: There are a lot of good details about the medical side of the brace, although I'm sure that some of these have changed. Still, visiting with doctors and the basic explanations are top notch. I wore a Boston brace that was all metal rods and canvas strapping, and today they are all plastic. Deenie's reaction is a bit extreme, but not unusual. Deenie's slight romance with Bud has its moments. Weaknesses: Wow, 1973, how did any of us survive you? Deenie's mother comes across as being an absolute nut, and Deenie's obsession with cheerleading and boys was very true to life. Even I tried out for cheerleading, believe it or not. The part of this book that I really disliked was what Blume was particularly lauded for at the time-- introducing taboo topics like masturbation. At the time, they were revolutionary, but today they seem just randomly stuck in the book, and they are sort of like a slap in the face-- appearing with no explanation and then not really addressed again. The "rap sessions" with the teacher were particularly awkward. I read this as a pre-teen and had to get it for my own scoliosis brace wearing pre-teen. While reading it with adult eyes, I don't think it is incredibly well written, (lots of holes in the plot and underdeveloped characters) I feel that most of Judy Blume's books geared toward girls of a certain age are still relevant and still important. It's funny the things that I remembered and the things I didn't. I guess you retain the things you care about at that time. Deenie's relationship with her mot I read this as a pre-teen and had to get it for my own scoliosis brace wearing pre-teen. While reading it with adult eyes, I don't think it is incredibly well written, (lots of holes in the plot and underdeveloped characters) I feel that most of Judy Blume's books geared toward girls of a certain age are still relevant and still important.